Enter a hunter's paradise at our virgin Pennsylvania forests are teaming with trophies! This is no walk in the park; this is a tough hunt in our natural environment spanning over 100 acres providing a realistic hunting experience for any level of hunter. Visit our photo gallery to see some of the game and our spectacular scenery. We feature onsite game processing equipped with a walk-in cooler. Bring your Bow, Muzzleloader, Rifle, or Pistol to have a great time! Accommodations include a cozy log cabin. Spend your evenings after your home cooked meal sitting by the fire talking with the boys or listening to old fashioned fiddles and guitars. After a childhood growing up in a thickly wooded area of Pennsylvania with a group of friends combed the forests, exploring all its rich secrets and such curiosity naturally fostered their love for hunting. 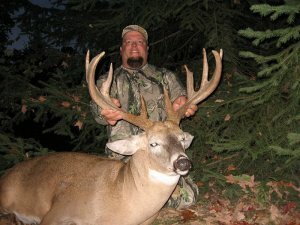 In the spring of 2000 raising the beautiful whitetail deer became their passion. Visitors have always been welcomed and have often times been coaxed into staying for a home cooked meal. The hunting preserve is a thick lush 125 acre hunter’s paradise. Thick with cherry and oak, it feels like you have stepped back in time. Giant glacier rocks lay in artful display where they were deposited thousands of years before. Swamp bottoms present a challenging hunt as they provide extensive cover for the elusive whitetail. Toward the center of the preserve a high table land juts out, creating a natural cave. What sets us apart from other trophy farms? Besides the natural setting, it’s the people. Your evenings can be spent alone contemplating the comfort of a cozy fire. Away from the hustle and bustle of the world or you may choose to sit in on a family jam session. Donna, who laughingly admits she has no musical talent, can boast about a family that does. The two neighboring farms belong to relatives who can’t resist picking up a mandolin, guitar, accordion, and tambourine all to accompany Ron as he saws away on his fiddle. The music and laughter is paused long enough for someone to tell a joke or relate a funny story from days gone by. Such atmosphere is interwoven with charm and honest to goodness friendship. Remember to bring your camera as the breeder stock or farm raised deer are gentle and provide excellent photo opportunities. During the off season we encourage folks to bring their children to cuddle the new born fawns. Or if their lucky, they can carefully caress the velvet of a huge antlered breeder buck. The log cabin is available for rental year round. The kitchen is well stocked and it sure beats any local motel. •One on one guided hunt. A 50% Deposit due upon booking, the deposit is Non-Refundable however may be transferred to future hunts. We are not responsible for injuries, death, or damage to personal property. These are wild animals in a natural environment.